The SD Surf 98 Boys Academy Select team beat Temecula FC Quails in an exciting Cal South President’s Division State Cup Final at Galway Downs, April 9, 2017. After trailing 2-0 early in the first half, Arturo Astorga scored in the 40th minute on a well placed shot into the left side netting. It was the first goal Temecula had conceded in State Cup play. Astorga scored again midway through the second half tying the score. Both teams had opportunities throughout the second half but failed to convert. The game ended knotted at 2-2 sending the game to extra time. Temecula scored from a corner in the first extra time and held that 3-2 lead late into the second extra time. A tactical change midway through the second extra time moved center back Kevin Kessler into the attacking third. Kessler didn’t disappoint and after getting behind Temecula’s back line was hacked down inside the penalty area. Kessler then converted the penalty kick making the score 3-3. The game ended 60 seconds later sending the match to penalties. Surf missed their first attempt but netted the next 3 and had a chance to clinch on the 5th penalty but were unsuccessful. Joe Penney, Arturo Astorga, Kevin Kessler, Efrain Senties, and Cody Jose took the first five penalties. Luiz Ramirez placed his 6th penalty and Temecula also scored. 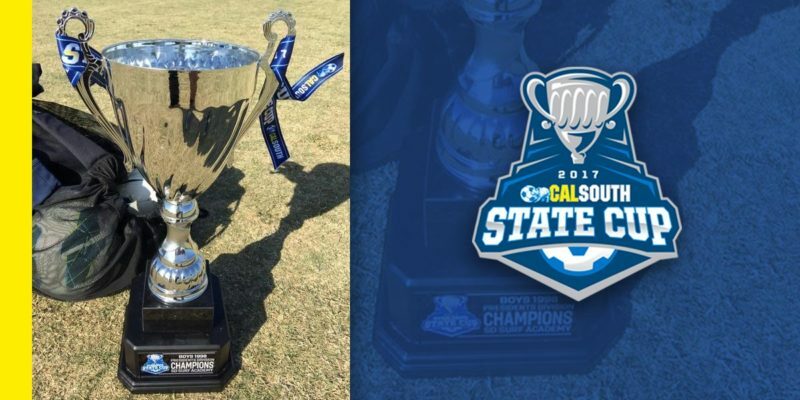 Shane Gurule converted the 7th penalty kick but Temecula were foiled by goalkeeper Cole Carter who saved yet another attempt to clinch the State Cup win for Surf 98 Boys Academy Select. Congratulations to the boys and coach on an excellent game! What a fantastic way to end the season!